When you're the home state of Michael Jordan and David Thompson, it’s no surprise that basketball dominates every winter season. But a new generation of star players coming out of the Tar Heel state is starting to tilt the center of gravity toward the fall. From small mountain towns where life revolves around Friday nights, to the wealthy suburban high schools where coaches are using aerial cameras at practices, high school football programs have evolved over the past decade to develop and nurture top-level talent. Players graduating from North Carolina high schools are helping to stock the rosters of major-college teams across the country. And while hoops still may be sacrosanct, North Carolina and its young athletes are earning a reputation as game changers on the gridiron. This season, at least 444 players from North Carolina are on top-level college football rosters, according to a Fayetteville Observer analysis. About 300 of them are scholarship athletes. Two players — Bryce Love at Stanford and Will Grier at West Virginia — are leading candidates for the Heisman Trophy, college football's most prestigious individual award. Others will help determine the conference and national playoff races, while Clemson's Dexter Lawrence is projected by experts to be the potential No. 1 pick for the 2019 National Football League draft. The Observer spent months building a database of players using 2018 rosters for all 129 teams in the Football Bowl Subdivision, the highest level of college football. The data included their hometowns, high schools, positions and conferences. 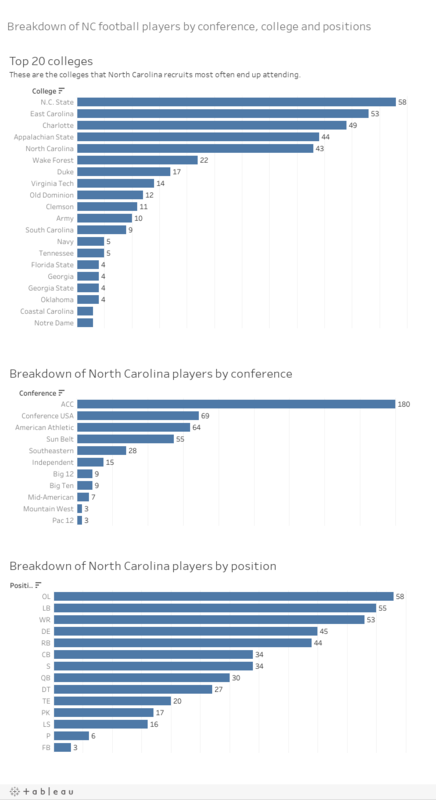 An analysis of the data shows just how influential North Carolina has become in the sport. In 2002, the state produced about 51 signees on FBS teams. By the 2017 recruiting cycle, there were more than 100. “I think North Carolina started to change in the mid-2000s,″ said Mike Farrell, the national recruiting director for Rivals.com on the Yahoo! network. Known as the godfather of recruiting, Farrell has been watching North Carolina evolve as a football state since 1998. Winston-Salem's Nicholson brothers were among North Carolina's top college prospects in the early 2000s. Both signed to play linebacker at Florida State. Allen, now a wide receiver for the NFL's Los Angeles Chargers, left Greensboro in 2010 to play at California. Humphries was one of the first major prospects to develop at Charlotte's Mallard Creek High School. Now an offensive lineman for the NFL's Arizona Cardinals, he signed with the University of Florida in 2012 in the midst of an explosion of talent emerging in the Charlotte metro. Where's the part of North Carolina that produces a bounty of star players? The Observer’s analysis of the 444 players on FBS teams this year found that the state’s largest cities produce the most players; no real surprise. But also in the top 10 are Wake Forest, population 40,000, with 14 players on team rosters, and Fayetteville with eight players. Shelby, a city of 20,000 people about an hour west of Charlotte, boasts a stunning 10 FBS players as alumni from its two high schools. Back in 2001, only three players from Charlotte-area high schools signed with what was then known as NCAA Division 1 programs. Chris Leak, one of the nation’s hottest prospects at Charlotte’s Independence High School, was one of them. The quarterback went on to lead Florida to the 2006 national championship. Doeren's Wolfpack will have 58 North Carolina players on its roster this season, more than any other team in top-level college football. They include All-Atlantic Coast Conference center Garrett Bradbury, receiver Emeke Emezie and offensive lineman Philip Walton, all of whom are from Charlotte. This year, the Observer found 69 players from Charlotte high schools on FBS rosters, and 113 are from communities in the surrounding metro area. Of those, 86 are scholarship athletes and at least 19 have been starters. That makes Charlotte the epicenter of major-college football recruiting in North Carolina. But how did the Queen City go from producing a handful of prominent recruits in 2001 to more than 100 in 2018? Langston Wertz has covered the high school scene for The Charlotte Observer since 1988. He points to coach Tommy Knotts, whose Independence teams won 109 straight games and seven consecutive state titles between 2000-06. “Tom Knotts was the first person to put a big emphasis on weight training around here,″ Wertz said. “At one time, Tommy could never beat Richmond. In 1997, Independence went to Richmond and lost a 17-point lead in the fourth quarter. Well, Tommy and (then-Richmond coach) Daryl Barnes were good friends, and Daryl had really adopted the weight-training stuff there. The next summer Tommy went to Richmond and spent time with Daryl, and he adopted the same system. The arrival of the Carolina Panthers in 1995 added more enthusiasm and influenced future college players such as Duke quarterback Daniel Jones. Twenty-four schools in the Charlotte metro will have players on FBS rosters in 2018, led by Mallard Creek with 12. The players include: Wake Forest's starting cornerback Amari Henderson; Oklahoma linebacker Ryan Jones; LSU tight end Thad Moss; Florida State linebacker Josh Brown, and Georgia offensive lineman Jordan Davis. Mallard Creek, with a student body of over 2,600, is a modern campus on a sprawling 24 acres at the northern edge of the city. The district has rapidly developed from a rural community to a thriving mixture of shopping centers and suburban neighborhoods. Mike Palmieri has been football coach since Mallard Creek opened in 2007. After some rough early years, his Mavericks have become one of the state's most successful programs, winning consecutive state 4-AA titles from 2013-15. Mallard Creek has also produced 27 players who have earned scholarships to FBS programs since 2009. But winning isn't the only priority for Palmieri, a native of Staten Island, New York. Part of his core philosophy is to prepare players for the next level, on and off the field. Watching a Mallard Creek practice provides a glimpse into Palmieri's formula for success. The workouts are scripted, precise and divided into timed periods. Junior varsity players aid the varsity by serving as a scout team to simulate the opposition's offense or defense. All the action is captured on video from a hydraulic lift at one end of the field, giving coaches an aerial view. The staff usually watches the video the next morning and may upload clips to the web, where players can review them before the next practice. At the center of the practice activity is Palmieri, whose career journey took him from Staten Island to Florida for high school and then to New Mexico to play junior college football. He returned to Florida to start his coaching career and turned Everglades High School into a winner during three seasons there before being hired to start the new program at Mallard Creek. Although he's long since left his New York roots, co-workers say Palmieri is easily agitated when hearing Charlotte locals pronounce “mozzarella.” “It's mootzarel!'' he'll utter to himself. Palmieri is meticulous, too, when it comes to his team. During practices, he's in constant motion to discuss points with his assistants as they run the drills. The scene is similar to what you would see at the college level. One of those is Grier, a former Davidson Day School player who'll be the starting quarterback at West Virginia. He is one of the leading contenders for this year's Heisman Trophy. Look beyond Charlotte and you’ll see Bryce Love, who grew up in Wake Forest and is another leading Heisman candidate. Tanner Muse from Belmont will be a key performer at safety for Clemson, while Fayetteville's Lamont Gaillard enters his third year as the center at Georgia. Both the Tigers and Bulldogs are strong contenders for berths in the national playoff. And then there's Dexter Lawrence, the 6-foot-4, 340-pound defensive tackle from Wake Forest High. Heading into his junior season at Clemson, Lawrence's unusual combination of size and athletic ability has many analysts rating him as the No. 1 selection in the 2019 NFL draft, if he chooses to leave school early. Conceivably, North Carolina could have the Heisman Trophy winner, a national champion and a No. 1 NFL draft pick when the 2018 college football season comes to an end in January. Basketball may not hold the monopoly in North Carolina for much longer. We've been blessed throughout the years to have a lot of good, smart football players.